Jeez that Aquaman cliff-hanger has been hanging for a while. 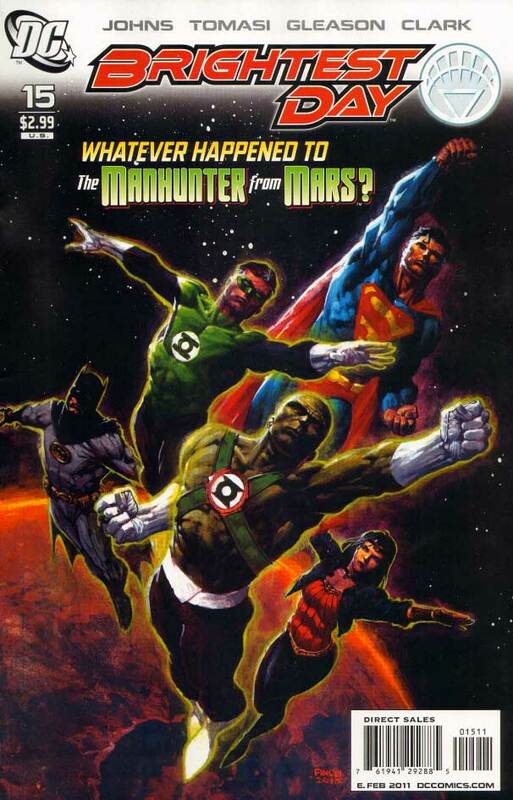 In this issue the King of the Seven Seas still gets the shaft end of the Trident, as the screen-time settles on sharpening up fan perspective on the Martian Manhunter and his differences to a certain 'Man of Adamantium' - or some such metal. Patrick has hit his stride with my favourite Martian (sorry Marvin) - and man does it show. 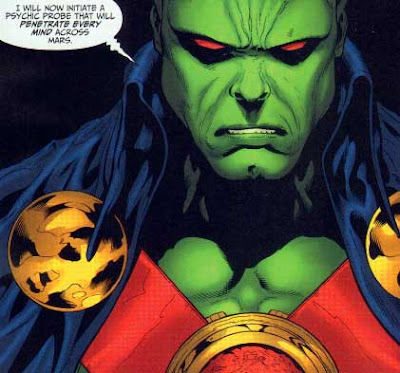 Plus - and it's a small thing I know - but I dig the way he gives the cape collar that Keith Giffen/Justice League look. It adds a lot more to the character as an imposing detective when it is done this way. Dan I keep checking in to see if you've posted your stuff yet. I've got this feeling I'm going to want to pull mine down out of shame when you do though. Hey you can call me slack if you want! :D One of my best mates is gettin married this week so now the last seconds of freedom thing is planned done and over I should have the piece I'm doing up soon. How about this as a promise? I'll draw Captain America in tonight (cos' everything goes better with Cap!) and have it scanned and posted by Friday! how dare you have a personal life beyond this blog! No worries. I'll just have to wait. I figured something was up as your blog was uncharacteristically silent these last few days. Silent - me - never - us redheads are a mouthy bunch! Status update; just finished inking the image tonight, so will scan that, then colour the original and post both soon. Next year I'm aiming for one a fortnight. That's my goal for the upcoming year. I've got to finish Alan's piece, then do our Holiday Card (fill-in the blank with your holiday of choice). Then I've got a Venom I'd like to flesh out. Sketched him out at work while on hold. I love Venom - so look forward to seeing that one! I actually have been sent a whole batch of comic themed holiday cards to feature on IADW, so look for that post as soon as I get some alone time with the scanner!